ATEP was established in 1991 and has about 30 employees. The company is privately owned and has annual revenues of approximately MEUR 6 (MSEK 50). Headquartered in Aix-en-Provence with sales and service branches in Nimes and Nice, ATEP sells and provides high-quality service for industrial compressors and ancillary equipment to a broad range of industrial customers in the region. The business will keep the ATEP name and becomes part of Compressor Technique Service. Atlas Copco is an industrial group with world-leading positions in compressors, expanders and air treatment systems, construction and mining equipment, power tools and assembly systems. With innovative products and services, Atlas Copco delivers solutions for sustainable productivity. The company was founded in 1873, is based in Stockholm, Sweden, and has a global reach spanning more than 170 countries. 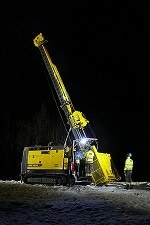 In 2011, Atlas Copco had 37 500 employees and revenues of BSEK 81(BEUR 9). Learn more at www.atlascopco.com .